Definition - What does Bharadvajasana on Chair mean? Bharadvajasana on chair is a simple seated twist that is very accessible for yogis because it is practiced while sitting on a chair. It has a range of physical benefits from the rotation of the spine and the stimulation of the abdominal organs. It is also a gentle, soothing posture for the body and mind. For this pose, the yogi sits sideways on a chair with the left side of the body against the back of the chair and the legs together. 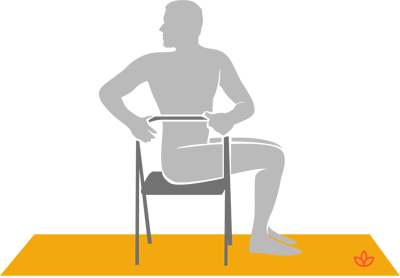 On an exhalation, the body twists to the left and the hands grip the back of the chair, encouraging the torso deeper into the twist while the lower body maintains its position. On an inhalation, the hands release and the torso rotates back to neutral. The posture is then repeated on the opposite side. Bharadvaja is the name of an ancient Indian sage who was one of seven legendary rishis with an unquenchable thirst for learning. Because of the accessible nature of the posture, it is considered ideal for beginners or those who might feel anxious about practicing yoga. The simple nature of the pose makes it ideal for turning the attention inward, observing the breath and developing mindfulness. Traditionally, Bharadvajasana on chair, like many twisting postures, is said to activate the manipura chakra, which is the third chakra. This chakra is associated with self-esteem, power and confidence. Working on postures that stimulate this chakra may help the yogi develop the self-belief and confidence to overcome obstacles or fears.